Data availability is one of the biggest concern in IT industry. After moving most of my services to the AWS cloud I was thinking how I can ensure data availability and accuracy in case of AWS data center failure or what if my EC2 EBS volume gets corrupted. I have a Oracle RDS running on EC2 instance. 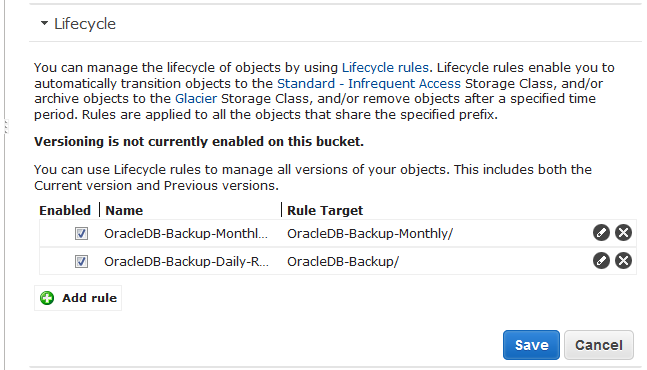 Use EC2 instance and take snapshot backup of your EC2 EBS volume. But my EBS volume is 120 GB, much bigger than the original SQL DB backup. Which means it will cost me more to store multiple snapshots in S3 (120 GB x 7days). S3 provides me 99.999999999% data durability. It means I will be able to access my S3 data in case of AWS availability zone failure also. Because S3 data synchronizes between multiple availability zone. How to recover a deleted file in Linux ?